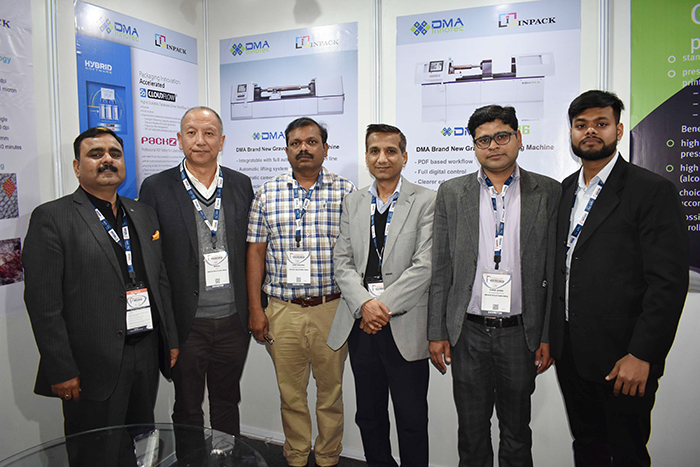 At IndiaPlast 2019 in Greater Noida, 28 February to 4 March 2019, DMA Innotec promoted its new generation gravure engraving machine, DMA R10 Series. The DMA R10 Series has full digital control and runs at constant 8 KHz engraving speed. The unique technical features First Full Cell (FFC ) and Point to Point (PTP ) achieve the excellent quality of fine texts and line works. The One Path technology of the engraver allows images and very small texts to be engraved in one path at 8 KHz, which improves the production efficiently. For optimal productivity and quality, DMA R10 is integrated with the user friendly Packz PDF-based workflow editor from HYBRID Software for directly accepting PDF format. “Today if we talk about the printing industry, everyone uses PDF format unlike in the engraving or rotogravure industry where TIFF format is more popular. We are the first company to use PDF format in engraving process,” said Rex Liu, CEO of DMA Innotec Group. Speaking about the advantages of the DMA R10 Series, Liu said, “One of the biggest benefits of using the R10 Series is that it can engrave dots in U shape. A normal engraving system cannot engrave in U shape. The ink transfer in U shape is much better compared to V shape engraving by normal engraving systems. In U shape, the cell bottom is long instead of being sharp. This means, it can hold more ink volume and allow better ink transfer which in turn delivers greater degree of sharpness and detail – even for lighter colors. Based in Germany and Taiwan, DMA has installed more than five engravers in India so far. In India, DMA Innotec is represented by InPack. “India is a very important market for us. Today India has only about 200 engravers. With the packaging industry growing at a rapid pace, the scope for growth is huge. Some few years ago, China had less than 200 engravers. However, today the number stands at more than 2,000. Just imagine, In India even if the number reaches just 800 installations in next few years, that will be huge,” concluded Liu.